Home / Blog / Hoengseong, South Korea, Shut down the illegal dog meat farms, slaughterhouses and markets. 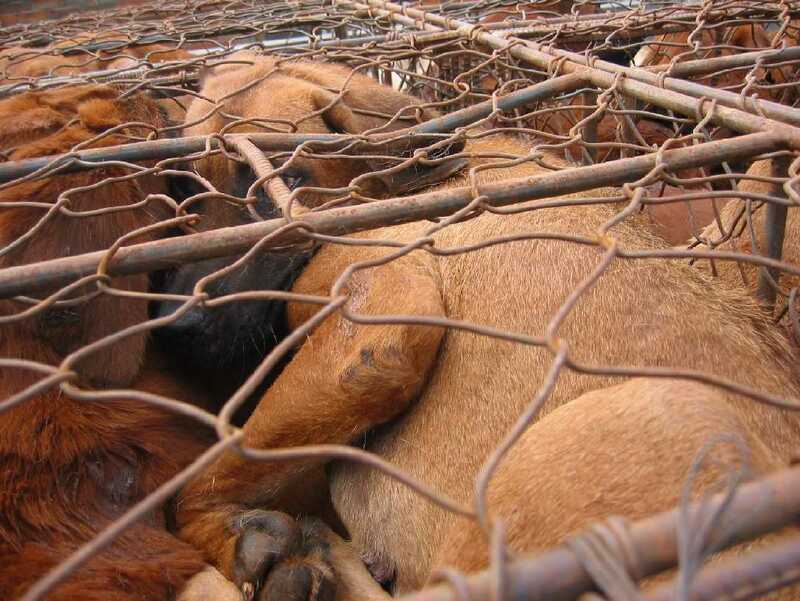 In Hoengseong, there are countless dog farms, slaughterhouses, markets and restaurants where the dogs, who are tortured their entire lives, end up being slaughtered in the most inhumane ways, such as by electrocution, hanging or beating; and then thrown into boiling water – sometimes while they are still alive. In many places, dogs are being killed in full view of other terrified, caged dogs; and this takes place in broad daylight. In addition, many abandoned and stolen former pets end up in this industry, and are subjected to the same cruelty. A Search Engine reveals the sickening scale of Hoengseong’s dog meat demand. Please sign petition, call, write and email the Hoengseong Mayor and the County Council TODAY! Subject: Hoengseong, South Korea, Shut down the illegal dog meat farms, slaughterhouses and markets. Petition: Hoengseong, South Korea, Shut down the illegal dog meat farms, slaughterhouses and markets. You can tell that it is so heartbreaking and so, so obvious the South Korean mayor and the Council members the Gangwon Provincial council members the Govenor the Goverment do not give one ounce of compassion for these dogs and cats. They simply do not care . There are no other words to describe it except they DO NOT CARE if these dogs and cats are tortured and feel pain and are suffering.If they took a moment to put themselves in a position of their power and really look at the suffering that these dogs and cats are induring and realize the immense cruelty of it all maybe just maybe they would do something to stop it all. I honestly believe they do not care enough. It’s not hurting them so why should they care?!?! I cannot fathom even if I was born a Korean why you would want to torture an animal and make them suffer. It is not humane whatsoever. If everyone who is involved in this could feel their pain and suffering maybe they would stand up and make a change but I keep hearing and seeing that they just simply do not care .. I pray for Gods creatures in my daily prayer and I will continue to keep all of them in my daily prayers until the end:(((( I personally will never give up on them. This hurts& angers me more than words can say.i would like to torture and boil these so called human devil’s.this is so unbelievable, uncalled for and evil. To feel compassion for our fellow co-inhabitants in the world requires a soul. That is the HUMAN WAY! South Koreans says dogs and cats doesn’t have a soul, therefore it’s ok to sadisticly torture them in the most hellish ways. Guess what? The only ones here that doesn’t have a soul are you South Koreans!